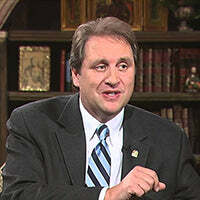 Dale Ahlquist (born June 14, 1958 in St. Paul, Minnesota) is an author, public speaker, Evangelical convert to Catholicism, and Catholic apologist. He has written, edited, or contributed to more than fifteen books on G. K. Chesterton. Ahlquist is a frequent speaker at national and international conferences, presenting engaging talks on Chesterton's wit and wisdom, his impressive and prophetic insight, and his role in the New Evangelization. In 2012, he was named a Senior Fellow of the Chesterton Library at Oxford University.